Our Visible Banking team reviewed the ‘IBC’s Dry House Challenge’ app as part of our search for the best insurance game apps for iPad (insurance gamification). With our video reviews of iOS apps series (iPhone and iPad), we aim to flag the most relevant insurance and banking game apps available to download, and assess the impact of gamification on insurance customers. 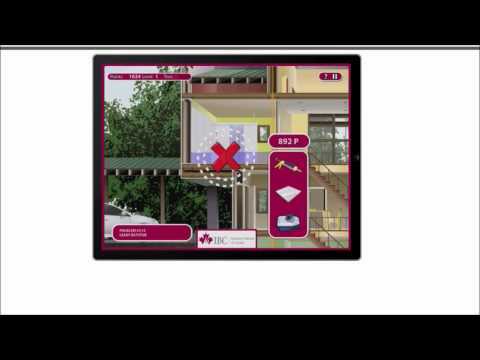 This is our sixth video review, this time for the free version of a iPad game from the Insurance Bureau of Canada, named ‘IBC’s Dry House Challenge‘. Your comments are welcome. And if you enjoyed watching the video, we invite you to click on the ‘Like’ button on YouTube and subscribe to our channel. You can find more info about the ‘IBC’s Dry House Challenge‘ app directly on iTunes. Have you played this insurance game for iPhone? In your opinion, how big is the opportunity for banks and insurance firms to launch or sponsor addictive mobile games like this home insurance game? Can it help change people’s perception of a financial services brand and possibly drive up the volume of insurance quotes? We invite you to share your thoughts about the gamification of insurance here, via twitter or on our Facebook page.